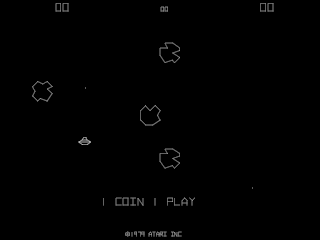 Asteroids was the product of Atari employees Lyle Rains and Ed Logg. At the time of Asteroid's creation, Atari was making forays into vector display technology. At the time, Vector displays could produce sharper details than (typical) raster displays, so it was seen as a popular display alternative for video games. One other company, Cinematronics, had already experimented with vector graphics in 1977 in their arcade interpretation of the famous MIT game Space Wars. Though vector graphics eventually disappeared from the arcades in 1986, a few other companies joined Atari and Cinematronics at making vector games, but no one made nearly as many as these first two companies. One of Atari's first attempts with vector graphics was a game known as Lunar Lander. In Lunar Lander, you attempted to pilot a craft to land safely on the surface of the moon. It was the graphical adaptation of a popular text game that circulated around academic computer science programs. Lunar Lander sold poorly and Atari decided to abandon the game's production in favor of a better game that was rising in popularity. Lyle Rains and Ed Logg had developed a game so addictive that several Atari employees would wait in line for a chance to play. The interruptions to their work became so frequent that they had to build a separate prototype just for their coworkers to play on so that they could continue their work. 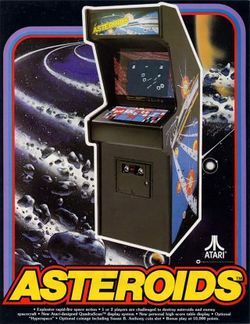 When they were done, Asteroids was released to the arcades and proceeded to get so many quarters that arcade operators had to increase the size of the containers they were using to catch all of the money. It was seen as a game that would knock Space Invaders off of its throne. In truth the two games lived side by side and did very well together. In 1981, it seemed only natural that Atari would bring this game home on its own systems. At that time, it was more common for a company to monopolize a popular title for bragging rights ("You can ONLY play this on Atari home systems") and less popular for games to appear across multiple platforms. So the game appeared on the Atari 2600 and the Atari 8-bit family of computers, namely the 400 and 800 at that time. The 8-bit version was also planned as one of the first Atari 5200 cartridges, but the non-centering analog sticks made playing the game far too difficult, so it was canceled. These versions graphics differed drastically from the arcade version, since the arcade was vector display and televisions were raster. Nevertheless, these conversions were accepted as having been well done, and sold very well. Note: the following story was taken directly from the Atari 2600 Asteroids manual. On a quiet serene evening the Cosmic Space Patrol sets out for the usual night cruise through the boulevards of space. This beat was always the same; calm, no action and no excitement. For some reason this night feels different. Shortly before 0200 hours some form of intergalactic material is sighted through the visual particle counter. The material is too large a mass to measure. It's drifting closer. Lookout, it's a giant asteroid boulder and it's headed straight for the Cosmic Spacecraft. The only chance for survival is to dodge the boulder or destroy it. Destroying it doesn't mean just breaking it up, it means vaporizing it. Small asteroid boulders are equally as fatal as large ones. Whew, the boulder just missed colliding with the Cosmic Spacecraft, but suddenly the Cosmic Space Patrol find themselves surrounded by thousands of the deadly asteroids. The Cosmic Space Patrol must act quickly to save their spacecraft and spare their lives. The spacecraft is equipped with photon torpedoes, hyperspace, shields, and flip control. The Cosmic Space Patrol is highly trained to handle this situation. Could you do as good a job as the Cosmic Space Patrol? How would you protect yourself if you were caught in a deadly asteroid belt? This is your big chance to fly throughout the dimensions of space and fend against asteroid boulders. The longer you survive, the more space hazards you'll encounter. This page was last edited on 10 February 2016, at 21:45. This page has been accessed 33,391 times.